We build custom free form pools and spas. Creating something simply beautiful to exquisitely designed! 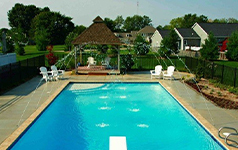 We specialize in in-ground pool and spa remodeling. We can make outdated pools come to life! We offer many features from sun shelves to waterfalls. Let us create your dreams! ACME means the point at which something is best, perfect, or most successful. Acme Pool Construction, Inc was established in 1993 as a family owned business by Peter Folkringa, Jr. and his wife Kim. Peter started in the pool industry as a teenager, originally working with his dad, who started Acme Pool Company in 1963. Acme Pool Construction has been creating new pools and recreating existing pools for many decades. With over 40 years of experience in building, remodeling and servicing pools, Peter along with his sons and longtime team, are excited to create and build your custom pool, designed uniquely just for you! At Acme Pool Construction, you can count on their trusted team to take pride in their work and doing their best to serve you! Acme Pool Construction serving all of West Michigan and more. Ada, Battle Creek, Bay City, Benton Harbor, Big Rapids, Cadillac, Copper Harbor, Charlevoix, Cheboygan, Empire, East Grand Rapids, Glen Arbor, Grand Haven, Grand Rapids, Holland, Ionia, Jackson, Kalamazoo, Kentwood, Ludington, Mackinaw City, Manistee, Mount Pleasant, Muskegon, Niles, Norton Shores, Owosso, Pentwater, Petoskey, Saginaw, Sault Sainte Marie, Saugatuck, South Haven, St. Ignace, Suttons Bay, St. Joseph, Silver Lake, Traverse City, Walker, Warren, Wyoming.